← Is this a melanoma? This five year old labrador has dilated pupils without much of a pupillary light reflex and a retina that looks just like the picture in the textbook for generalised progressive retinal atrophy with an overly reflective tapetum and narrow vessels. But the dog can see quite happily to traverse a maze of chairs in the waiting room and follows a dropped ball of cotton wool with no problem whatsoever. Is your presumptive diagnosis wrong? 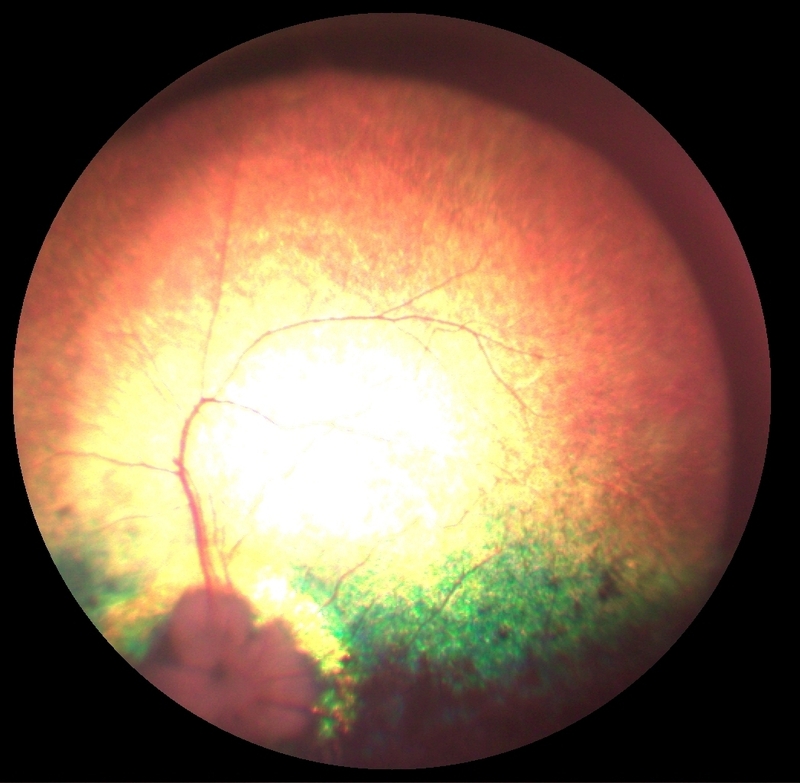 Here’s another picture of the dog’s retina with the flash attenuated somewhat so the vessels are easier to see. No – your diagnosis is correct. The dog has early gPRA, but the key early feature of this is nyctalopia, night blindness. Turn off the room lights and the dog is blind as a bat – or actually more blind, as it doesn’t have echo-location! It will be interesting to see how rapidly the phototopic or day vision reduces. The condition the dog has is known as rod-cone degeneration, as the rods die first followed by the cones, with their demise probably accelerated by the higher oxygen levels given that there are no rods left to use the oxygen. We are hoping that using a mixture of dietary anti-oxidants we can slow down this cone death and thus maintain day vision for a considerable time. 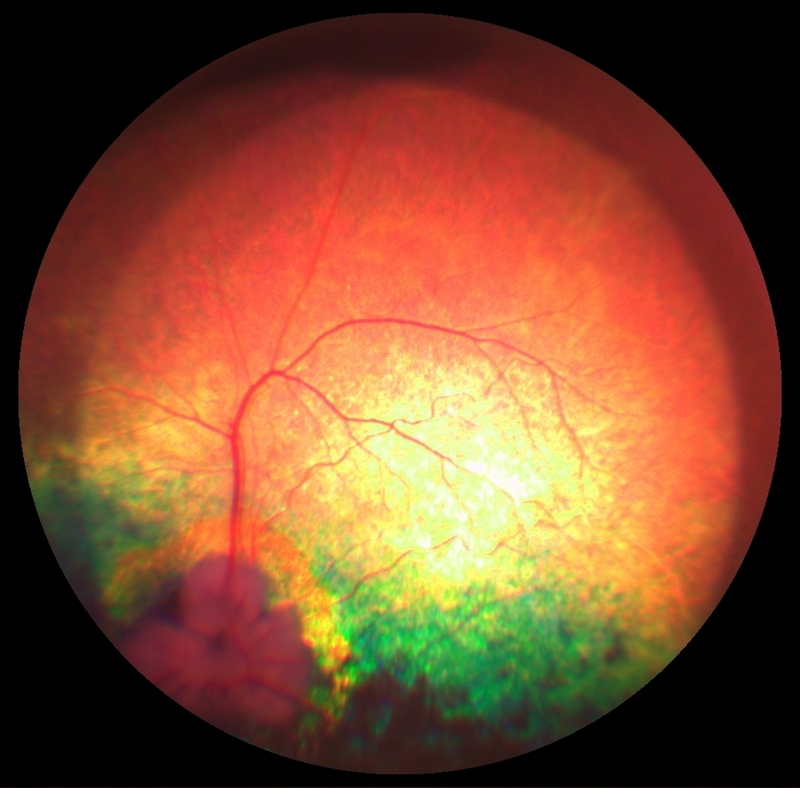 If you are interested in reading more about this my article on oxidative stress and the eye in Veterinary Clinics of North America, though rather old by now, may be of interest – find it at: http://davidlwilliams.org.uk/resources/file0261.pdf.